Many students end up with generic essays because they try to say too much about themselves in their allotted 500 to 650 or however many required words. This happens the most when their essay topic is too broad. I believe we all make these mistakes in writing because we fear that we will error on leaving out something important. So we try to work in as much information as we can. These colleges and universities want to learn as much about us as possible, yes? What happens when we cover too much ground about ourselves in our college application essays is that we end up not saying much of anything meaningful. Our most interesting points about ourselves get diluted because we try to cover too many. Here’s my tip for avoiding generic, dull essays: Get specific. The best way I have found to narrow an essay topic into one that is more focused and meaningful is to brainstorm ONE PART of yourself to showcase in your essay, instead of cramming in everything great you can think of about yourself. I have a nifty post on exactly how to do that by learning how to Find Your Defining Qualities. If you are just starting your college application essay writing adventure, this is the time to read and discover your defining qualities and characteristics. You can also rein in your topic by framing it around one of your core values, which you can find in this post: Find Your Core Values to Rock Your Essay. If you sharpen your essay topics right at the start, you have already greatly improved the chances of your essay being more interesting and relevant—and more effective in its role to help differentiate you from other applicants. So instead of writing about how you are a natural leader in your community and go into all the activities and lessons you have learned, find a way to write about a smaller piece of your leadership experiences. Try to find a quality or core value that you have developed as a leader and make your case for how you learned about it. Are you a leader because you like to be at the head of the pack and a role model? Are you a leader because you like to bring people together and build consensus? Are you a leader even though you are more of an introvert? If you can narrow the main point you want to make about yourself in your essay, you will end up going deeper and revealing more about yourself when you explain how you got that way. Trust that it’s better to say more about one part of yourself than trying to explain everything you can think of. 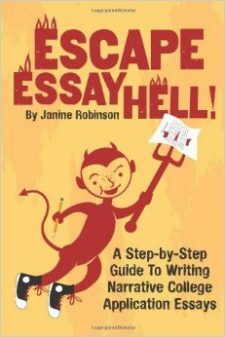 If you happen to live near Laguna Beach, California, I’m holding essay writing boot camps this summer. Learn more.